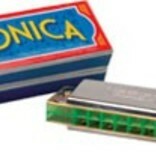 Entertain the crowd with our 16 hole harmonica! Comes packaged in a durable cardboard box with pop up lid. Measures 5.5 x 1.5 x 1.5 in box. Ages 3 & up.